Postpartum depression can often affect marriages and relationships. Some couples are able to come through the darkness even stronger, but for others it ends in devastation. Often, postpartum depression can be disguised as rage and misdirected towards spouses and partners, causing marital problems. Being open and honest about what you’re going through can make a huge difference in your relationships. Heather knows firsthand about the devastation that postpartum depression can cause in a marriage. She watched her marriage fall apart, all the while being in denial that she even had postpartum depression. She didn’t get help until it was too late, but she shares her story in the hopes of saving someone else from the pain that she experienced as a young mother. *This post may contain affiliate links. This is a guest post and all opinions are those of the author. When I found out I was pregnant, my husband and I were so happy. We had been married for a two years and had just bought our first home. The timing seemed to be just right and all our family was so happy for us. My pregnancy was pretty easy but I gained a lot of weight. My husband kept making comments and jokes about it which made me feel bad because I was pregnant – didn’t he understand that pregnant women get fat? My son was born via c-section and he was having difficulty breathing so he was taken away right after he was born and I didn’t get to see him. It was hours later before I was finally able to hold him. He had a red mark on his face from some burst blood vessels, which they told me was normal and would go away in a few weeks, but I was ashamed to show off my baby. I thought people would think he was ugly. My husband didn’t have much experience with babies, so he mostly let me do everything. I felt like he didn’t want to bond with our son because he didn’t want to hold him or change his diaper. Anytime I was breastfeeding our son, he left the room because he said he didn’t want to think of me that way. I felt alone. Like really alone. As though I was a single mother doing all of this. My mom stayed with us for a month to help but it just made things worse for my husband and I. He stayed out late to try to avoid her and complained all the time about how she took over the house. But at least she changed diapers and held the baby. My mom made comments about how he treated me and I got super defensive. I was constantly fighting with both my husband and my mom and always felt forced to take sides. The stress of those relationships had such a big effect on me. After my mom went back home and my husband went back to work, it was just me and the baby. Things were still rocky between my husband and I, but he was starting to spend more time with our son, at least. I was stressed out and worried all the time, that I barely slept. I always felt like I was doing something wrong, either as a mother or a wife. At night, I would lie awake in bed and go through everything I said or did that day and what I could have done instead. Then, during the day, I would be so exhausted and irritable. My parents came to visit for a week when my son was about 6 months old. One evening, my mom sat me down and asked me how I was feeling. She said she was worried that something wasn’t right. I got defensive and said she didn’t know what she was talking about. I said I was fine, that she’s not even here all the time so how can she say that. Later that night, I overheard her arguing with my husband. She told him that she thought I had postpartum depression and said he should have noticed or done something. She told him that I needed help and I needed to go see a doctor. He got mad at her and kicked her out of the house. After that, I started to pay more attention to how I was behaving. I realized that I didn’t do much during the day. Baby and I stayed in bed all day. He was only barely sitting up now, not crawling, so we had no need to move anywhere else. I didn’t feel depressed. I mean, I was happy to spend time with him. I mostly felt nothing. I didn’t feel motivated to do anything or go anywhere. But when my husband came home in the evenings, we would fight. He would ask what I did all day, and I would get really defensive. Anytime he wanted to take the baby out, to visit his parents or anything, I would fight him over it. If he did it anyway, I would cry the entire time and worry about them. I didn’t trust him. I wouldn’t let him bathe the baby alone or feed him or go anywhere without me. And I couldn’t sleep if my baby was awake, so I got up with him all night and I couldn’t nap while he was with my husband. Originally, we had decided that I would stay home with the baby while he worked. But after 6 months, our finances took a real hit and we fought about whether or not I should go back to work. He wanted his mom to look after our son during the day so that I could work and the thought of it made me sick to my stomach. But we had no choice, we ran the risk of losing our house. And at least it was better than putting him in a daycare with strangers, but I was so stressed out about it. I went back to work but I just couldn’t focus. I would sit at my computer and stare, my mind consumed with what my son was doing at that moment. I imagined all kinds of bad things happening or good things happening that I was missing out on. I was miserable at work and I came home at night and took it all out on my husband. I blamed him for not being able to support us, for forcing me to go back to work when I didn’t want to. After a year of me being miserable at work and taking it out on my husband, he told me he couldn’t put up with this anymore and he thought we should take some time apart. He said that maybe we just needed a bit of break from each other and then we could try to work things out. I was devastated. I knew things had gotten bad but I wasn’t at that point yet. I thought it was just a rough patch and we would get past it. He went to stay with his parents, but because his mom was watching our son during the day, he suggested that our son stay there too and I could get him on weekends. I was furious and refused to allow it. So I picked up and dropped my son off everyday, but on the weekends my husband wanted to see him too, so he spent one day on the weekend there as well. My son was spending way more time with my mother-in-law than he was with me and I hated every second of it. He started learning things from her, certain words or phrases, but I was the one who was supposed to be teaching him these things. I felt mad and left out that my husband had his son with his mom raising him and I wasn’t even in the picture. I imagined them happily around the dinner table, not even missing me there. So out of spite, I found a daycare for my son. The cost was more than half my pay check but it was worth it for me to have some peace of mind. One day, the daycare called and said my son had fallen down and bumped his head and started throwing up so I needed to take him to the hospital. He had a mild concussion and was okay but I was terrified to send him there anymore. He started going back to my mother-in-law’s even though I hated it. I pictured them laughing at me for trying to take him away and then I came running back to them when it didn’t work out. I was humiliated. I had no idea what to do, and I felt frustrated and mad and disappointed and alone. I felt like a complete failure. My life was nothing like what I imagined it would be. One night, when I went to pick up my son from my mother-in-law’s, my husband came home at the same time. He was with a woman I had never seen before. He introduced her to me as a friend from work, but I knew what was really going on. I called him outside and really let him have it. I didn’t think this whole separation meant we were seeing other people, we were supposed to be working on our marriage. But he said he didn’t see any improvements and thought we should go ahead with the divorce. He was so cold and heartless. I took my son and left in a sobbing mess. I called in sick for work the rest of that week and I stayed in bed and cried. My heart was broken and I felt so devastated and lost. I called my mom and she came out to stay with me. The first thing she did was take me to a doctor. She explained to the doctor that she suspected I had postpartum depression when my baby was first born but that I was in denial about it. The doctor said that was very common. He gave me a prescription for antidepressants and a couple weeks later I started to feel better. I felt like I could start to take control of my life again. I called my husband and asked him to go to counselling with me. He said he didn’t want to do counselling, he just wanted a divorce. I knew it was because he had met someone else. My mother convinced me to move back home with her, but it was a 2 hour flight away and I wasn’t sure how my husband would feel about that. I told her I would think about it. But before the ink was dry on our divorce papers, my husband was introducing our son to his new girlfriend. That made me furious because he didn’t even discuss it with me first. He said that he wanted to sell our house, or that I could take over the full mortgage payments – which he knew I couldn’t afford. He wanted to move in with his girlfriend. I realized that he was moving on without me and so I had to do the same. We sold the house and I moved away to my parents house. My son was 3 years old at the time and my ex-husband and his girlfriend came out to visit once a month. Less than a year later, he married his girlfriend and then a few months later they were expecting a baby. After that baby was born, the visits became fewer and fewer. By then, my son had started kindergarten. My ex-husband asked if our son could come spend the summer with them, as he wanted him to get to know his baby brother. I didn’t like the idea of it at all but I let him go anyway because I didn’t want to get into a big custody battle. For those two months I was completely miserable. I needed to start taking the antidepressants again just to function. This has been my life for the past 8 years. My son is now 13 and he’s brilliant and handsome and kind. He has spent the summer with his father every year since he started school and every summer I have to take anti-depressants while he’s gone. The thought of my son being with my ex-husband triggers all those bad memories and feelings from that first year postpartum and I can’t get rid of them no matter how hard I try. 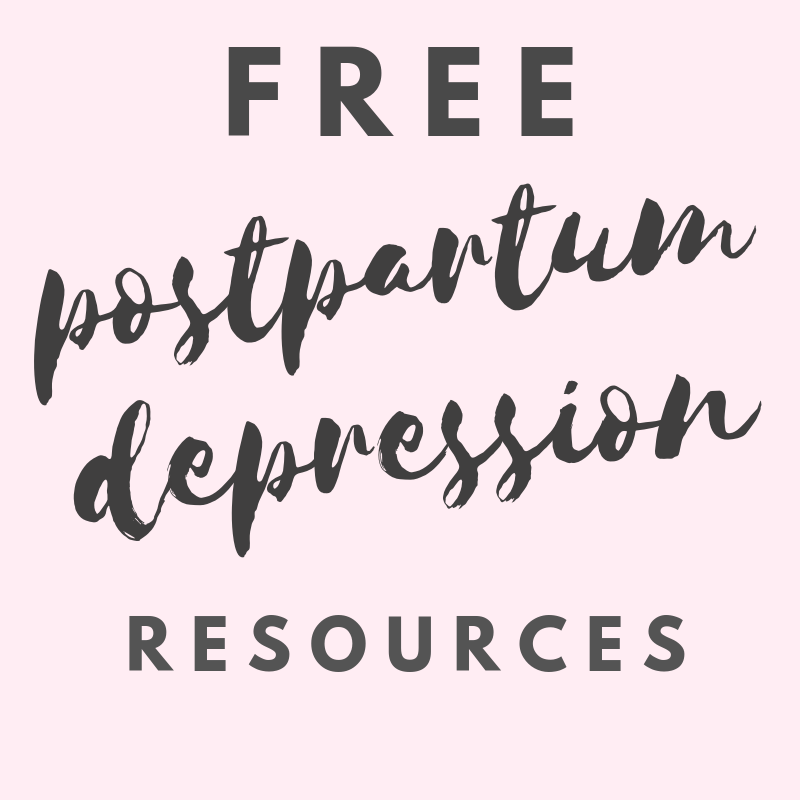 I think that if I had known more about postpartum depression, then I wouldn’t have felt so defensive when my mom tried to help me. I took it very personally, as though it was something I was doing wrong, when really it was completely out of my control. I don’t know if my marriage would have worked out if I had gotten help, but I think I could have avoided a lot of pain if I had. I took so much of my feelings and anger out on my husband, and he didn’t understand it either. If he had known that what I was going through was out of my control, maybe he would have been more sympathetic. Life is full of what if’s and I try not to focus on them. But maybe my story can save another young couple from going through all of this. I want to thank Vanessa for allowing me to share this story that’s been lingering at the back of my mind for so many years. She told me to turn something dark into light and I hope that’s what I’ve done today. Share your story!! !